Just a final reminder that you have a touch over two hours from the time of this post to get your final bid in for my Woomba Woomba quilt. I close at 12 midnight Australian time. Who would like to help me decorate my house? By which I mean, who would like to help me decide which walls to put which paints on so that a man can come and do the actual work? If you want to play you might like first of get hold of the relevant paint chart. I know colours will look different on each screen ( they are vastly different between my home and work laptops and different again when I painted with tester pots) but at least you will get the idea of how one paint relates to the other. Then here are the rooms. In the photo above I am standing my pation doors in teh 'sun lounge' looking into the dining roon and to the doors leading to the lounge. Also, over the sofa which is temporarily plonked in the sun room there is a large window. So, we are more of less picked for paints.I am still debating a couple of close choices between brands but for your purposes and advice you need only consider Four Farrow and Ball Paints from the above chart : Green Blue, Lichen , Pavillion Grey and Ringwold Ground. On my screen the latter looks very pink but it is not in real life - it is creamy. The idea is to make the lounge, dining and sun lounge work as three distinct rooms but also to make them all flow together if the room is opened out. We have chosen to use the Green Blue on all the lounge walls save for two big alcoves by the chinmey breast which will be Pavillion Grey. We have chosen a plain teal fabric for curtsians and an off white and silver blue suite and light grey carpet. The kitchen will either be in lichen or another brand similar but very slightly lighter. It is cream with black tiles. (b) reverse that ( i.e) paint the arch, the diningroom to lounge door wall and pation door wall and the wall with the window and adjoining the kitchen ringwold and the two long solid walls (in the top photo the one with the brush propped up against it and the one next to it with the paint samples on) Lichen. (c) none of the above - please specify. In terms of furniture, it is all an ash that looks very much like light oak and there will be a sideboard on the dining room long wall and a sofa and lamp table on the sun lounge long wall. under the window lamp table and two swivel chairs, nothing on the wall by the kitchen, and on the left of the door going to the lounge a tall display china cabinet. Opinions quick please- I have to choose at 8.30 on Monday morning. This post follows on from New Year Goals (or Oh How Life has Changed)- Part Two. which you may want to read first. As I said in that post, I was intrigued by Lisa Call's habit of choosing two words to represent her focus for the year. I didn't think I was going to copy her thing but, in my Zen reflection days ( I told you - you need to read the last post if you don't know what I am talking about,) I found two words rising to the fore: nesting and preparation. Hence the nesting. There are I think, a minimum of 24 places in the house for which I would like to create a sewn item ( ranging from bed quilts through wall quilts to coffee table runners). Now do you see why entering every category at Festival sounds achievable? Of course I could fling together some log cabins and the like and I could do all that fairly quickly. But I don't want ('I don't WANT said the Princess, stomping her feet') to spoil my beautiful new house by slapping fabric down and calling it art. Or even slapping fabric down and calling it a liberated log cabin. I want to make stuff that gives me satisfaction so I feel it is enough of an achievement and good enough quality for me to want to live with it. Although, I like liberated log cabins and they relax me to make them so there might be some of that whilst I cogitate on my next Great Work of Art. Ok. My First Great Work of Art. Which is kind of how the Preparation part links in. For so long as I have to spend a good time of my weekend precious quilting time choosing taps and admiring the tile grouting, I am not going to be producing as much as I will when my new, shiny, fit-for-a-Princess studio is ready. And what time I have should go mostly to 'nesting quilts'. But I will not be able to keep myself from other exciting possibilties. And why should I? After all I do this for fun, not to challenge Bobby Sands in the self-denial stakes. So this year is also about preparation for when I have time to do more. I have visions of quilts in my head that I know I do not yet have the skills to actually produce. So I choose to start to learn them now. I choose spend time on small projects in preparation of making larger ones later. I shall start to record ideas and sketches to come back to later. I shall set myself up to get better. In my last post I talked about making choices not goals and about preserving the feelling of balance and relaxation I have finally achieved in life in general. So I give myself permission to choose to change all of what I am telling you as and when I feel like it. 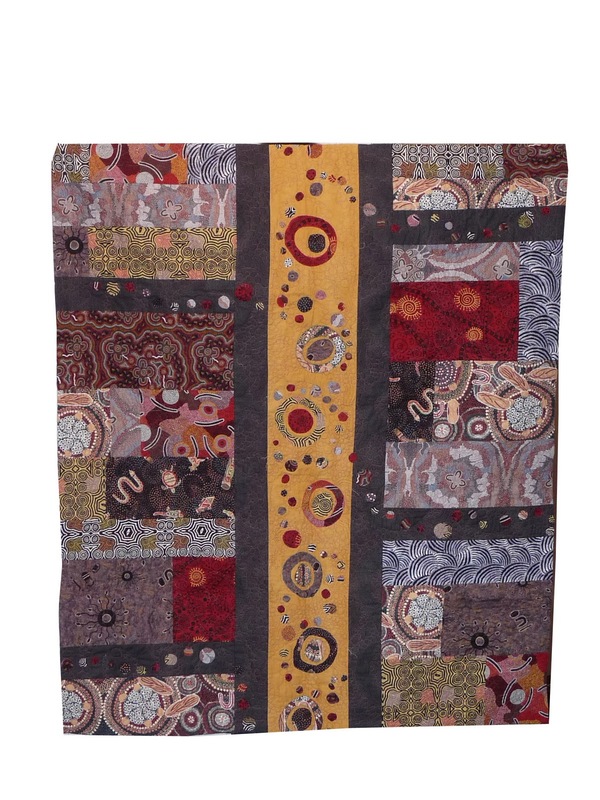 * to buy as many quilt books as I like. Its not frivolity. Its education and preparation. * do a little dying and screen printing even if I have to wait until summer and do it outside because my wet studio will not exist for a good while yet. Oh and right now? I choose to sign off and go to bed with a book. 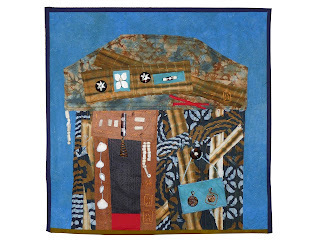 I have been using keeping my Queensland Flood Quilt Auction at the top of my blog as an excuse for not posting recently. But really it was because I wanted to do a New Years post and got stuck in a debate in my head : ( put the kettle on at this point- you might need it). To go out of order, part of the debate ended up being did I want to post my nineteen days worth of musings for the world to read at all? Not that they are particularly secret or personal but because I fear thaye are boring. But I decided I did want to, because I have gained so much inspiration from other people's musings I thought there was the odd chance that it would help someone else. And hey, if I am boring you, go do something better. No offense taken I promise you. As long as you come back another day to see if I am being more interesting. I have long had a New Years habit of getting out my journals from previous years and looking at my New Years entries to give me a sense of what I was concerned about then, how life has changed, what I wanted to achieve and what I actually have achieved. I then write a new journal entry for the next year. This included personal goals and tasks but also lots of professional ones. Indeed, back when I was a self-employed barrister life was all about goals and self-set targets. It was up to me to find much of my lecturing and writing work and my executive looking leather filofax bulged with plans, targets and to do lists. I needed a system to keep track of multiple clients, deadlines, up to four different sets of travel bookings a week, tax and VAT records and personal tasks. I have to say, I was pretty efficient at it. And pretty done in by it. If you look at my journals for 2005 - which of course I am not going to actually let you do :) - it is all desperate scribbles about finding balance and debating whether financially I could afford to only take bookings four days a week and keep one for admin. Eventually I did this and, whilst the filofax stayed the same, the journals became less frantic. With the caveat of keeping balance then, I'd say that the lifeplanning standard advice to set short and longterm life goals and keep then under review probably played a very large part in me being where I am now in my professional life and a vital part in my never finding myself in Cardiff when I should be in Leeds. ( I am aware that any lifestyle in which that is real and ever present danger is probably not all that normal). In fact, when I looked for last years Goals, there were none. There was a vague New Years entry in my travel journals but none of the life planning of prevous years. 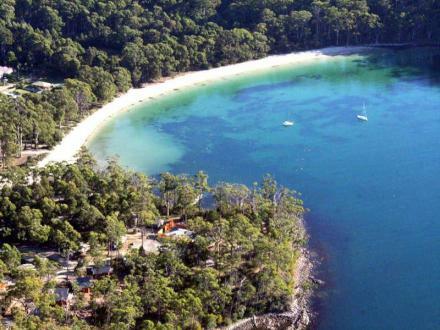 There was a picture of the secluded beach in Tasmania where I stood on the sand on New Years Day and realised that for the first time in many many months it was not going to matter today if I dropped a ball because there were none I had to keep in the air that day. So I kind of had a clean start to start again setting different kinds of goals and plans. I feel no compulsion or need to do that at all for my professional life this year but I do see my 'arriving' in that area as the opportunity to fully develop my artistic life. In December I discovered Lisa Call's various posts on goals and the debates between not setting goals at all, and the merits of having targets and aims. (She started with the latter, flirted with the former and reverted to the original goal setting.) I was particularly interested in how she chose words for each year to live by. So, on New Years Day I pulled out my pile of journals, put on the Viennese concert and start to write. Or started to think about writing becuase suddenly - not so interested in goals. Did I need them? Was this the stage in my life where finally I could cast all that off and just be? I decided to just live with that debate for a few days and see what feelings arose. (How very Zen of me!). I noticed that I felt resentful if I thought about scheduling tasks in the studio but quite interested if I thought about words such as 'focus' and 'choices'. I felt very reluctant to make to-do lists (which then created a kind of self-set obligation) or 'goals' which seemed to set up the pressure not to fail. But I felt rather lost without any plan. I like not being stressed. I like having time to relax. I like beeing free to potter. I don't like aimlessness and lack of direction. So this year I am not making Resolutions. I am not setting goals or targets. But I am going to make some good choices. Choices that are about filtering out what I do not have time to do despite me really liking the idea of them. Choices that keep me relaxed and chilled but also enthused and enriched. I am going to focus on studio tasks that givem me real not part statisfaction. And what are those choices you ask? Ah, well, I shall tell you, but I think that's for another post don't you? Herewith * the first completed quilt of 2011. Which would be an achievement had the fabric not been bought in the last month of 2009 with a view to immediate use on my return from Australia! I am not all that good with quilt names but (unless you all have better ideas) am contemplating Circling Back for all the memories of quilt shops Down Under it invokes. This is the front. 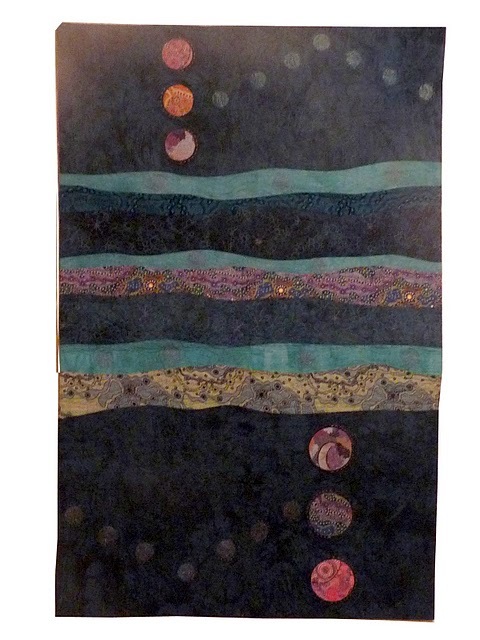 And this is the second completed quilt of 2011. 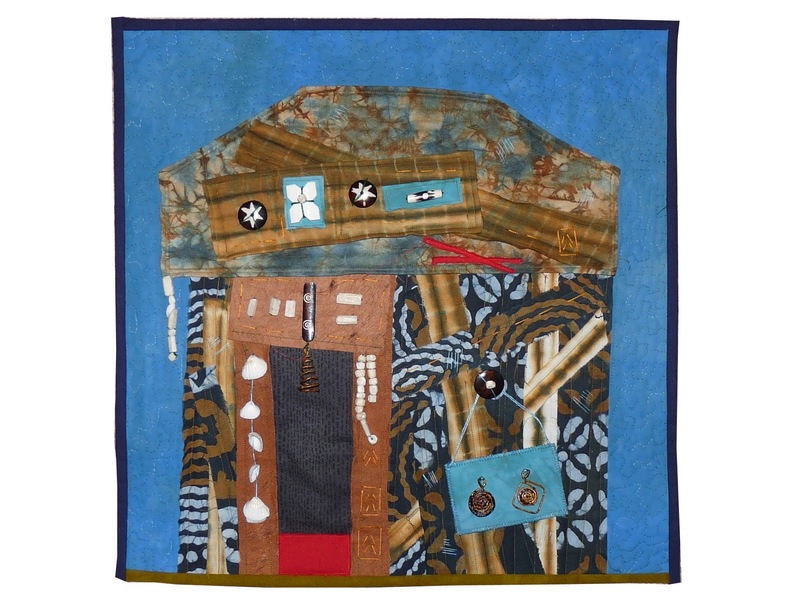 A seventeen inch shack quilt which may well bcome a kit in a series of little shacks. I am not sure now about the roof. It is a Shaman (medicine man)'s shack. I know I have been blog deficient lately so I have some longer more thoughtful posts lined up. In my head that is, not actually posted, but it is ia start! 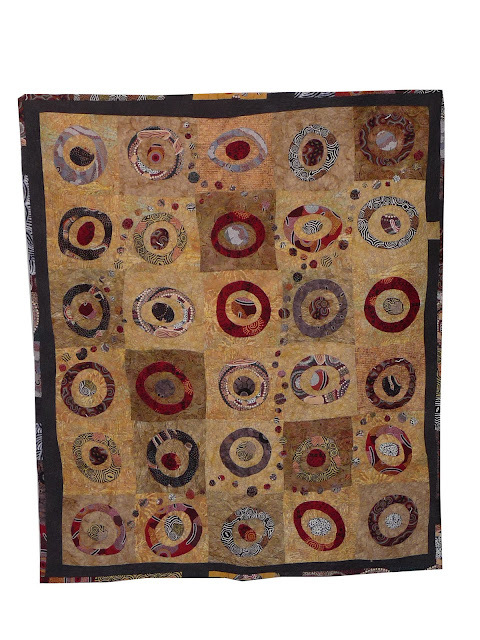 Finally, Don't forget to visit my Quilt Auction in aid of the Queensland Floods and snag yourself another Aboriginal inspired quilt. * Herewith is a good word don't you think? Along with aforesaid, thereunto and hitherto mentioned. Do I sound like a lawyer?! Even with my house in a hopeless state of 'destroy to rennovate' disprepair, I cannot help but realise how much better off we are than the people whose homes hae been flooded in Quuensland. 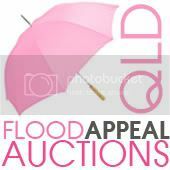 Accordingly I am particpating in the Queensland Flood Appeal auctions to raise money for the relief effort. (As ths photo was taken in artificial light in a hurry this morning,the colours are more truly represented by the detailed shots) I will ttry to get a better photo up soon. This is how it all works. 2. Place your bid by adding a comment here stating how much you are willing to offer to own Woomba Woomba.. Your bid must be greater than the previous bid. 3. All bids must be in whole dollar increments. 4. The auction is open to all and the price will include postage to any address worldwide. (Although I reserve the right to send by surface to a non-european address depnding on the cost). 5. 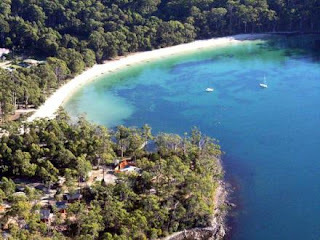 The auction is now open and closes at midnight on the 24th of January 2011 (Sydney, Australian time). 6. I will contact the winner at the conclusion of the auction. The winner must commit to sending their bid to the Premier’s Flood Relief Appeal and provide an email receipt as evidence of payment. Non-austrailan donors can still donate by credit card using the online payment link or there is also information about how to do an international bank transfer. 7. Once I have evidence of payment Woomba Woomba will be posted to its new owner. My thanks to Toni Coward for organising this and Brenda Gael Smith for drawing my attention to it with her quilt auction.